Save yourself time and money, and decrease the chance for crime in your buildings with Crime Free Multi-Housing (CFMH). We work with you to create safer buildings that have less property damage, and more satisfied tenants. We’ve seen a 36% reduction in crime in CFMH certified properties! CFMH empowers tenants to actively reduce and/or report crime. We help you make your tenants feel safer & happier. assess and improve your building’s security. 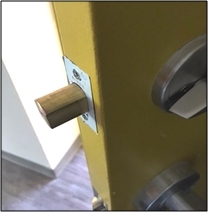 CFMH shares tips on where to find what you need to improve the security of your building. With the support of CFMH staff, the Owner/Property Manager promotes a safe rental community by hosting an annual Safety Social for tenants. A Police officer shares crime prevention tips. This event offers managers and residents a chance to get together and address safety and security issues, share improvement ideas, and have some fun. 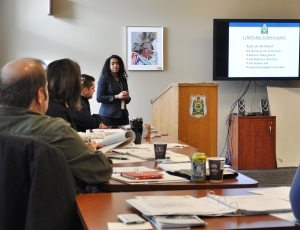 Get daily Saskatoon Police updates on any crimes that affect your buildings. Quickly learn about broken windows, noisy parties or more serious crimes. CFMH certified properties receive free advertising to thousands of tenants each year. Access affordable, relevant, ongoing training and information, to make your job easier. 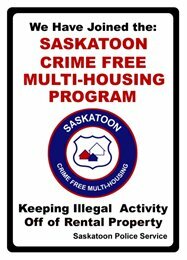 Certified CFMH buildings can use the Saskatoon Police Service Crime Free Addendum. New tenants who sign this legal document are making a commitment to live crime-free within your building. If illegal activity does arise, CFMH may share the details of the crime with you, which can assist with tenant eviction. Reduced crime will help lower maintenance and repair costs, and increase your property value. Office of Residential Tenancies (ORT) - Learn about the rights and responsibilities of landlords and tenants in Saskatchewan. When landlords and tenants cannot resolve disputes on their own, both have the right to ask the ORT to make rulings and settle the dispute. Safer Communities and Neighbourhoods (SCAN) - they will investigate if you suspect a Building is regularly used for illegal Activities (drugs, prostitution, gang or criminal activities, child sexual abuse or the unlawful sale or consumption of alcohol). You can stay anonymous. 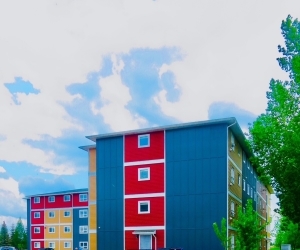 Crime Free Multi-Housing - How Safe is Your Rental Property? - a detailed checklist for a safe rental home. Crime Free Multi-Housing - Community Connections - Connect to helpful local agencies for: mental health and addiction services; health; justice and family wellness; and emergency shelters.